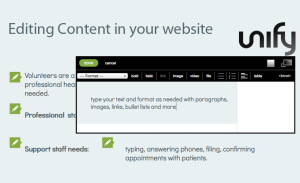 Unify™ was a simple content editing system that was easily be applied to any HTML website. Sorry to say that Unify is no longer supported and no longer works. 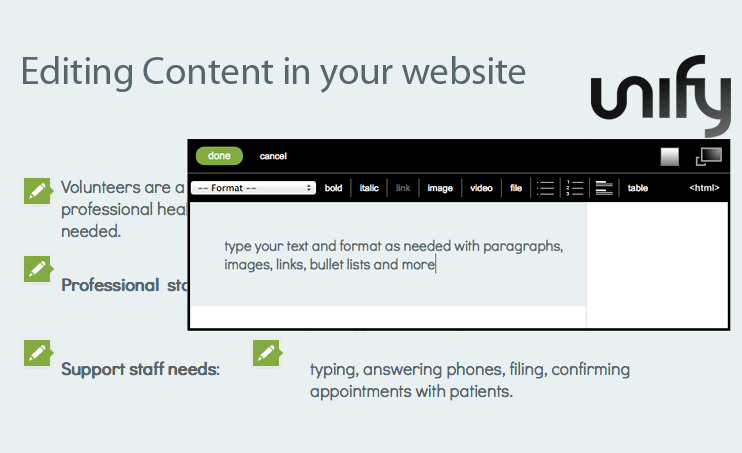 Unify offered a quick, easy way to add-on editing capabilities for logged in users. While there are replacements and even improvements on the Unify experience, we recommend steering away from such as relying on more reliable and long-lived sources which would include WordPress (the leading CMS in the world today) and others such as Squarespace, Drupal, Joomla, Weebly, etc. We recommend you learn of the pros and cons of any consideration. Websentia recommends WordPress, mainly for support, autonomy, and immense scalability. Unify requires little change to the way a current website looks and feels. While there are some areas of a website that don’t work well with Unify, for example rotating images or photo galleries, this management system is simple, cost effective, and very light-weight if all you want to do is to be able to make simple edits to your existing web pages from any desktop computer with internet access. A Unify license allows you to make edits to as many pages as you like for a single domain. You can have as many users as you like. Each user has unrestricted access to edit any and all Unify Editable Regions. Unify has a handy feature called Unify Repeat Areas which enable the logged in user to select an area, then click and drag it to a new location to create a copy of the repeatable region. Then, the user can change the content of the copied region thus creating a whole new region with the same layout and styling but new content. This is very handy for listed events, products, client testimonials… just about any arrangement of blocks of similar information. Contact Websentia Web Services if you have questions about using a Content Management System for your website.